Everyone on the crew was friendly and accommodating. They were courteous, efficient, and professional every step of the way. I would highly recommend Hedberg and Son for any project. 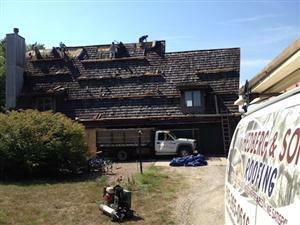 Hedberg and Son Roofing has been providing quality roofing solutions for over 31 years. By focusing on our customers’ needs, we have developed an outstanding reputation over the years. We have grown to include all aspects of commercial and residential new construction, existing roof tear off / re-roof & repairs with standing seam metal, cedar shakes/shingles,TPO/EPDM/PVC, modified bitumen, stone-coated steel tile/shake/shingles from Metro Metal& Decra, simulated shake &slate from EcoStar, EDCO Arrowline, Inspire and 25 year to Lifetime warranty asphalt shingles from GAF/Elk, OwensCorning, Malarkey and Certainteed. We provide quality workmanship and reliable service before, during, and after the sale. We are very proud of our status as a GAF Master Elite Contractor which identifies us as one of the top 2% of roofing contractors in the country. We have also been appointed as a Certainteed Master ShingleApplicator/Quality Master and an Owens-Corning Preferred Contractor. Our status with these manufacturers validates their confidence in our business practices and in our skill and knowledge of installing their products. These unique designations also benefit you by increasing the non-prorated period of your warranty and expanding the warranty coverage from the standard materials only to also include the labor associated with resolving a warranty issue. The most important asset of Hedberg and Son Roofing is our employees. Our tenured employees have a minimum of five and as many as twenty- five years of experience. This is fairly uncommon in the roofing business as most companies have a high turn over rate. We regularly receive compliments on the high caliber of workmanship and courteous demeanor of our employees. Our expert employees are the reason we have so many loyal customers. They are also the reason we are the only contractor to offer a warranty on our workmanship for the LIFE of the roofing material you select. We would be happy to schedule a time to meet with you to discuss your individual requirements. We look forward to earning your loyalty and to adding you to our list of satisfied customers. There are many satisfied customers that have used Hedberg & Son Roofing. Read what they are saying. WE TAKE THE FOLLOWING MEASURES MANY OTHERS DON’T TO ENSURE THAT YOU WILL HAVE THE BEST QUALITY, LONGEST LASTING ROOF POSSIBLE: THE ROOF HAS TO BE REPLACED – NOW! BUT HOW DO WE PAY FOR IT? ?